JAKARTA–Fifteen years after the Asian financial crisis sent overheated Indonesian property markets tumbling, the archipelago nation’s real-estate markets are soaring again–just as economic storm clouds gather across the world. By some measures, Jakarta is among the hottest property markets in Asia. Asking prices for condominiums in central Jakarta have shot up nearly 12% since the second half of 2011, according to Knight Frank, a property consultancy, and more than 50% since late 2008. The city’s office market, meanwhile, is one of world’s tightest, with “grade A” buildings reporting occupancy levels of 98.1%, compared to 92% in Singapore and 85% in Kuala Lumpur, according to property firm Jones Lang LaSalleJLL -0.64%. Developers are rolling out some of the biggest new projects Jakarta has ever seen, especially Signature Tower, a 111-story building developed by PT Grahamas Adisentosa, a subsidiary of tycoon Tomy Winata’s Artha Graha group. The tower, with an estimated building cost of US$2 billion, will be the world’s fifth-tallest if completed. Real-estate exuberance has also spread to other Indonesian markets, including the iconic tourist island of Bali. Property analysts say land prices have jumped 50% during the past year in the touristy Seminyak area, where many new bars, hotels and malls are located. Developers are also looking to second-tier cities in Indonesia, where commodity-price gains in recent years have pushed incomes higher. Michael Riady’s PT Lippo KarawaciLPKR.JK +6.45% in late September announced it was building 13 shopping malls, including in Bali, Medan and Surabaya. Few analysts expect a repeat of those episodes, given the fact that Indonesia’s economy is still posting strong economic growth by historical standards. But it’s possible the pace of residential price gains and rent increases could slow, especially if Chinese demand for Indonesia’s core commodity exports doesn’t rebound soon. For now, developers are planning to charge ahead with plans to add hundreds of thousands of square meters of new office space in the next half-decade. This is almost twice the building work of the years leading up the 1997-98 crisis, though the pool of available office tenants is larger now. They’re also cranking up construction of condominiums, hotels and shopping malls. One of the swankiest developments is the Ciputra World project in South Jakarta’s trendy Kuningan area. The project, developed by Indonesia’s PT Ciputra Property TBK, will include a shopping mall covering an area of 130,000 square feet, Raffles and W-brand hotels, condominiums, an office tower, and even a Ciputra Art Museum. The Lippo Group, meanwhile, has embarked on a project called the St. Moritz over 11.4 hectares of land that includes a newly completed luxury apartment block called the St. Moritz Penthouse & Residences and a wedding chapel, a hospital, an international school, an office tower and spa developments. A “presidential suite” tower launched in May 2012 will include units with private gardens and open-plan hot tubs facing the sky. The Signature Tower, meanwhile, is set to include a six-star luxury hotel with 300 rooms, grade-A office space and conference facilities. Many property analysts say the Signature Tower–which is supposed to start construction later this year–will never take off, much like the Nakheel Harbour and Tower in Dubai that was proposed and then later canceled in 2010 owing to the last global downturn. 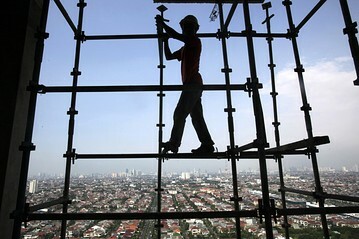 But there are also some property investors who believe the time is now for Indonesia to break through with some highly ambitious projects that draw more international attention, especially ones located on prime real estate like Signature Tower, which is planned in the Sudirman business district where many of Jakarta’s most prestigious addresses are located. Many foreign companies are still expanding their operations in Indonesia, despite economic uncertainties elsewhere Google Inc.GOOG +1.78% recently opened an office in Jakarta, while Tony Fernandes’s AirAsia5099.KU -1.96% budget airline recently moved its regional headquarters away to Jakarta from Kuala Lumpur. A recent survey by the American Chamber of Commerce in Indonesia found that 25% of American companies plan on expanding their operations in Indonesia, compared with just 4% in Singapore, citing Jakarta’s relatively low costs versus other cities. Grade-A office rents, while still some of the lowest across Asian cities, have jumped to 175,000 rupiah, or US$18 a square meter compared with 100,000 rupiah at the end of 2010. Meanwhile, “middle-grade” condominiums–those that sell for between 10 million and 15 million rupiah per square meter–are selling especially quickly, analysts say, with developers adding more than 6,000 units to the market this year.